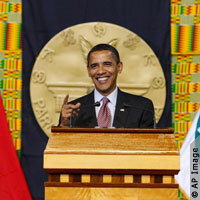 President Obama spoke in Ghana on July 11, 2009 about US policy towards Africa. In this episode of Development Drums, Todd Moss and Chris Blattman join me to talk about the speech, and what it means for the US and Africa. Particular thanks to my father, Brian Barder, who is turning into an expert sound engineer. He set up the link between me in Addis Ababa and the interviewees in the United States, and made the recording. Worth reading through some of the comments too – pretty heated debate still going on. Is it possible to subscribe to that podcast with another program than itunes (I use Media Monkey). And if yes, where do I find the link? Just dropping a note to say thanks for this series of podcasts. It’s a fantastic resource both for practitioners and a wider audience.